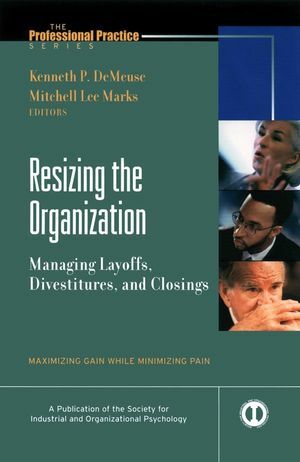 Presented by the Society for Industrial and Organizational Psychology, this much-needed resource offers a wealth of theoretical information, best business practices, and winning techniques for executives who must guide their companies through the often difficult processes of mergers, acquisitions, downsizings, and other transitions. Written by top experts in the field, Resizing the Organization is a field guide for applying industrial and organizational psychology theories and practices to the management of change strategies. Kenneth P. De Meuse is professor of management at the University of Wisconsin-- Eau Claire. He has consulted with numerous organizations including Union Carbide, AVEX Electronics, Intergraph Corporation, Nestle USA, and Lucent. He has written numerous articles on the topic of employee attitudes and organizational behavior and is the coauthor of the The Team Developer (John Wiley & Sons, 2001). Mitchell Lee Marks is a consultant to a broad variety of organizations in the United States and abroad, including AOL, GAP, DaimlerChrysler, Motorola, and Lucent. He is the author of numerous articles, scholarly journals, and books, including Joining Forces (Jossey-Bass, 2000). 1. The Realities of Resizing (Mitchell Lee Marks, Kenneth P. De Meuse). 2. Who Moved My Drink? The Preparation for the Closure of Seagram's Spirits and Wine Business: A Personal Experience (Ronny Vansteenkiste). 3. Another Layoff? A Dot-Com Reality! My Story (Jeffrey Crandell). 4. Contribution-Based Process for Continually Right-Sizing an Organization: Experiences from W. L. Gore & Associates, Inc. (Raymond G. Lorenz). 5. The Effects of Organizational Resizing on the Nature of the Psychological Contract and Employee Perceptions of Contract Fulfillment (Scott W. Lester, Jill R. Kickul, Thomas J. Bergmann, Kenneth P. De Meuse). 6. The Impact of Corporate Downsizing on Employee Fulfillment and Organizational Capacity (Jack W. Wiley, Scott M. Brooks, Emily L. Hause). 7. Financial Consequences of Employment-Change Decisions in Major U.S. Corporations, 1982-2000 (Wayne F. Cascio, Clifford E. Young). 8. Resizing and the Marketplace: The Response of Customers and Competitors to Reorganization (David T. Bastien, Todd J. Hostager). 9. The Impact of Layoffs on Family, Friendship, and Community Networks (Daniel C. Feldman). 10. Moving as the Markets Move: Planning for Resizing (Kathryn D. McKee, Nina E. Woodard). 11. How to Implement Organizational Resizing (Roger D. Sommer). 12. Revitalization After Resizing (Mitchell Lee Marks). 13. The Hidden Costs and Benefits of Organizational Resizing Activities (Anthony F. Buono). 14. Organizational Adaptability: Rethinking the Resizing Process (Jessica L. Saltz, Philip H. Mirvis). 15. Quicker, Faster, Cheaper, Smarter: Resizing Organizations, Resizing Employees (Kenneth P. De Meuse, Mitchell Lee Marks).